Rae Carr has been licensed to convert the existing Anni Arts printable craft ranges to cutting files in popular cutting file formats. 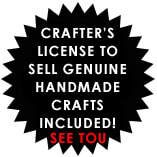 • Handmade, tangible items created from this file can be sold, but the cutting file is for personal use only. • The Anni Arts template may not be extracted and used to create new graphic collections as downloadable products or flat printed out sheets. • The Anni Arts illustrations may not be used to create new graphic collections and are intended for use as designed for this set. 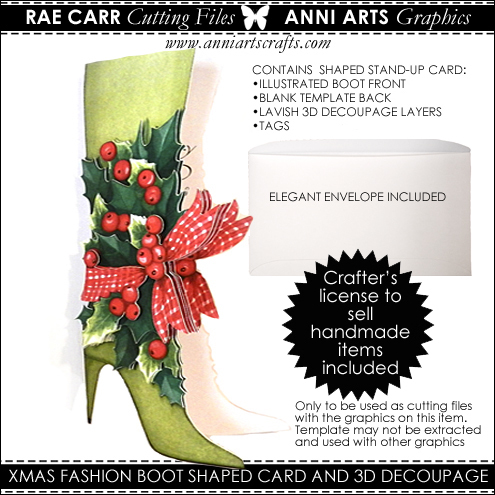 This 3D layered boot shaped card, has lots of elements for lavish layering. With cut files you can easily add the many 3D Decoupage layers to this boot! Anni Arts Xmas Fashion range. An envelope has been added too! • Instructions are included to help with assembly. • Please be sure your cutting software program will open/import one of the formats offered before purchase. This 3D layered handbag packet, has lots of elements for lavish layering. With cut files you can easily add the many 3D Decoupage layers to this bag! Anni Arts Xmas Fashion range.